Are you aware of the impacts of our daily actions on the environment and thus are willing to take the first steps to make green changes to your lives? Are you in search of further deeper and meaningful learnings in Sustainable Living or Holistic/Alternative Education? If you answered 'Yes' to any of these, then 'Befriending Bhoomi' workshop is for you. Come to learn new ways to care for Mother Earth by making your homes and lives more greener by our workshop on 'Earth-friendly living'. Discover eco-friendly alternatives and earth-friendly practices for personal and home care solutions. Deepen connection with yourself and your community by imbibing concepts such as zero-waste living, localisation and more. Want to make a more impactful change for yourself or your loved ones? Check out one-year fellowship courses in Bhoomi College through our orientation session was taken by our current year fellows, which will follow the workshop. Learn more about Bhoomi College, its initiatives and offerings and how you can join our family. 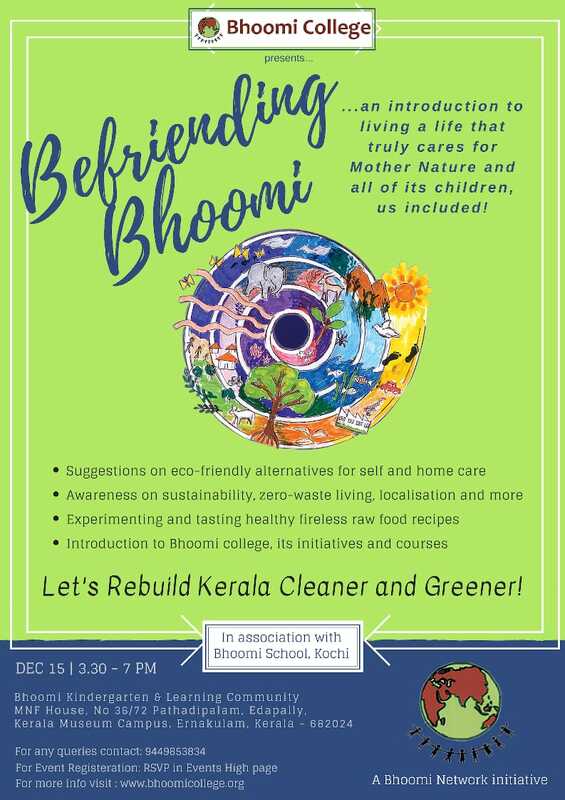 'Bhoomi' in 'Befriending Bhoomi' stands for both Mother Earth and Bhoomi College itself. So come let's befriend each other! This is a FREE event. However, please do RSVP so that we can make arrangements accordingly. For more details: phone: +91 9449853834 or Email: bhoomiprogrammes@gmail.com.